On behalf of the Westerville, Ohio Division of Police, our thoughts and prayers are with the immediate family of Deputy Sheriff Matthew Chism and the extended law enforcement family of the Cedar County, Missouri Sheriff's Office. Rest in Peace brother and watch over us. Rest in Peace Brother in the Arms of our Lord. Prayers for your family and your law enforcement family. Chief Deputy John M. Tomaino Sr.
A police officer should be remembered not by how he died, but how he lived! A great man has gone to secure a safe path for the rest of us to follow. Thank you to you, your family and the Cedar County Sheriff's Office. Our country is a little less safe without you. Rest in Peace Brother! God bless and keep your sweet wife and son. Matt will always be a hero to us. For those of us who knew you in both private and professional capacity! The devastating news of loosing you was a shock. less than two days ago you were in my home assuring my wife that all was ok, and laughing about a Cowboy hat that looked like a burglar in our home. Your assurance of the situation over the phone to me was compforting as we laughed and discussed the callout. Having known you and your family for many years has been a blessing. The Chism family has contributed much to our community in many ways. It takes a special individual to put on a badge and work under the stress and risk for so little. Thank you for your service and dedication to our community. We will keep your family in our prayers and do what we can to help. Deputy Chism: May God welcome you with open arms as you have done your duty here. Rest in Peace my brother. So very sorry for this loss. My thoughts & prayers are with family & friends. They just keep getting younger it seems ... The Heros . Job well done Son of Stockton. R.I.P. Son of Valor, with Honor. God speed Deputy Chism. May God be with your family. Meet their needs Lord. Protect & provide. You will be missed brother. We salute and honor your service. The 36th Basic Law Enforcement Training Academy sends our deepest and most he artful condolences to the Family, Friends, and Co-workers of Fellow Officers. During this time we hold close to memories and good times shared as a source of comfort. Being ever mindful of the pride they embraced when wearing their uniform. Thank you for your service. Rest in peace my brother. Officer!! Rest in Peace Deputy you will always be remembered! When I read of your heroic sacrafice I was overcome with sadness. My heart goes out to your family especially your young child. May your family and friends know that you will NOT be forgotten. You are the definition of a True American Hero. Rest in eternal Peace. From the beginning of time after Cain killed his brother, Abel, there has been a need for law enforcement officers to protect the weak and to bring evildoers to justice. This work is necessary in a sinful world and is dangerous. In modern times, some six hundred and fifty-three law enforcement officers have sacrificed their lives to protect the citizens of the State of Missouri. 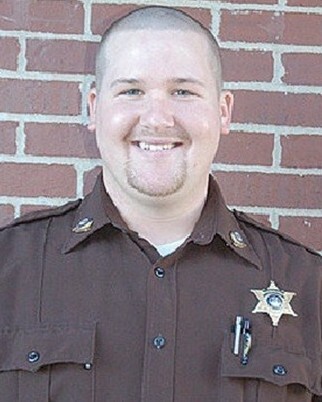 Today, we honor the sacrifice of Deputy Sheriff Matthew Chism, of the Cedar County, Missouri, Sheriff’s Office; who was shot and killed in the line-of-duty on Sunday, November 2, 2014, following a vehicle pursuit and the subsequent foot chase and struggle in El Dorado Springs, Missouri. “Lord God, we are grateful for the life of Deputy Sheriff Matthew Chism. He died serving us. Help us never to forget. Help us celebrate the life of Deputy Sheriff Matthew Chism and honor his sacrifice. Be with the family, friends, and colleagues of this fallen hero. Comfort them and give them your strength. Guide those who seek to take care of the family of this hero. May those empowered to do so, care for them with integrity. In commemorating the death of this hero, help those who mourn to remember that death is not the end. Death does not have the final say, but is simply the transition to the glorious life to come. They should look forward to that life to come with joy and thanksgiving. As for the citizens of Cedar County, Missouri, help them to faithfully equip their law enforcement officers with the best tools to protect their county. May their training be adequate to the task. Help the citizens of Cedar County, Missouri, to remember to pay their law enforcement officers fairly and treat them with respect. Help the citizens of Cedar County, Missouri, to obey the law and treat each other with dignity so as not to add to the burden of crime and pain to their county. The time for mourning will soon pass. We have now remembered and celebrated the life lost in this great tragedy. As the family, friends, and colleagues of Deputy Sheriff Matthew Chism go forward, they must celebrate the good things in their lives; and to celebrate life itself! Now, Deputy Sheriff Matthew Chism, may the Lord bless you, and keep you: the Lord make His face to shine upon you, and be gracious unto you: the Lord lift up His countenance upon you, and give you peace. On behalf of of the men and women of the Lawrence County Missouri Sheriff's Office, Rest In Peace Sir, thank you for your service and sacrifice. God Bless you, your family, and your extended family at Cedar County Sheriff's Office. I thank you Brother for your service and ultimate sacrifice. I pray for you that you rest in peace knowing your watch is over and we now have the watch. I pray for peace and strength for your family and all of your brothers and sisters. Special Agent R A Curtis Ret. Giving your all in your last act for the citizens of Missouri and fellow police officers, you made certain this killer could kill no more, which he probably would have. You are a true American Hero. God Bless You, your family and the Cedar County Sheriff's Department. My prayers to the family in this tragic time.